Operating hours: Mon - Fri, 8:00 am - 5:00 pm, Sat 8:00 am to 4:00 pm. Closed Sundays. Call Skyway: (269) 925-5114; Fax (269) 926-8313. Skyway Aviation has provided over 50 years of quality FBO services is welcomed to Southwest Michigan Regional Airport (KBEH). Skyway's Flight Services office is located at the eastern end of The H. B. Ross Terminal Building. A "Courtesy Van" is offered on a "First Come" basis. Rental cars and catering services can be arranged. Flying Colors Aviation is known for custom painting and refurbishing of large-scale paint or restoration projects. We pride ourselves on our state of the art facilities. C&D Associates Inc. Manufactures a complete new line of combustion heaters for all general aviation aircraft. Call for an appointment today at (866) 961-2424 or fax (269) 695-6004. 1571 E John Beers St.Joseph, MI 49085, Ph(269) 429-6753 Fax# (269) 408-8190 Chief Pilot: Tim Gaipa, Commercial Pilot Land and Sea, ATP, CFIIMEI. Pilot Services – Twin through Cessna Citation. Flight Instruction – Single Engine,Multi- Engine, Instrument. Flight Review – FAR 61.56 or FAR 61.57 d Instrument Proficiency Warbird Training & Checkout - North American AT6. Boeing Stearman PT-17,Aircraft Sales. Mr. Gaipa's North American T-6 Texan was a single-engine advanced trainer aircraft used to train fighter pilots of the United States Army, Air Forces, United States Navy,Royal Air Force and other air forces of the British Commonwealth during World War II. Designed by North American Aviation, The T-6 is known by a variety of designations depending on the model and operating air force. 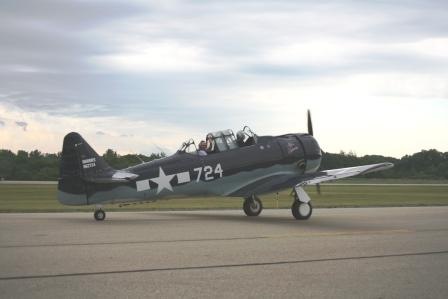 The USAAC designated it as the "AT-6", the USNavy the "SNJ", and British Commonwealth air forces, the Harvard, the name it is best known by outside of the United States. It remains a popular warbird aircraft. Pilots may contact the ASOS system by phone at (269) 925-9008, or by radio using frequency 121.55. Visit AVSAT pilot briefing area to utilize the WSI Pilot Brief, Weather System. This system allows pilots to check weather patterns, plot a flight course, print maps and file flight plans.